He shimmies back down the mast. It is shot dramatically, but not overly so, more in the manner of the everyday difficulty of tricky tasks. He gathers his things and places them below deck. He fills a jug of water. And then, as the rain begins to pelt the boat, he shaves. He’s about to ride out a monsoon, so, hey, this may be his last chance to deal with those excess whiskers for awhile. This man fighting for survival on the open sea, we realize, is a practical man. Robert Redford is 77 years old. His first on screen acting role was an episode of “Maverick” in 1960. He has founded Sundance and, in turn, helped power a powerful indie movement (and bless him for that). He has won a Best Director Oscar (“Ordinary People”) and a Lifetime Achievement Oscar. He has earned a Kennedy Center Honor and the National Medal of Arts. He has played Bob Woodward, The Sundance Kid and The Great Gatsby himself. But in spite of such achievements, it’s as if “All Is Lost” was the singular moment to which he has been building his entire career. His acting has often stemmed from a strawberry-blonde reticence, an innate ability to maintain a level of secrecy, to suggest his characters’ overarching motives are theirs alone to know, and yet still quietly draw you into the emotion of their plight. His charisma comes partly from the craggy face, sure, but much more than that it is a matinee idol stoicism that he can employ like no other. The most recent film ripe for likely comparisons to “All Is Lost” would be “Cast Away”, the 2000 drama that found Tom Hanks stranded on a deserted island in the Pacific. Hanks, however, a fine actor in his own right, is much more extroverted, and so he inevitably needed a volleyball to talk to. Redford, rest assured, does not need a volleyball. Aside from the opening voiceover, he must say no more than twenty words during the film, and these words may as well be automated – an S.O.S., a holler for help, a well-timed swear word. He doesn’t need to speak. He has a non-verbal conversation with us for an hour-and-a-half, and you will remember every syllable. Director J.C. Chandor, who also wrote the screenplay, offers virtually no shots of Our Man in the wide open water, a mere speck in the oceanic nothingness. Rather the camera remains generally attached to Redford, and so we remain attached to him too. I don’t say “Our Man” to be flip. That’s how the closing credits bill him. Our Man. His struggle and ours. The script is scant in broad details as even that voiceover to kick off the film provides no information of traditional pertinence. The character is writing and apologizing to someone, yet we don’t know whom nor for what. The mere fact that he is on the high seas alone, eating beans from a can, indicates a disconnect from whatever life he had before. Thus, when he wakes one morning to discover a random shipping container has fatally severed his boat, the film becomes not just a test of Our Man’s mettle, a fight to stay alive no matter what occurs, but a perilous journey to eradicate every single loose end from his previous existence. 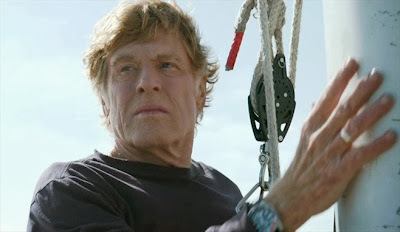 Bit by bit, all is lost, pushed away, cast off the starboard side, sunk, as the film’s relentless physicality gives way to something spiritual, a re-purification, a haunting baptism by fire.